One of the planks of Senator Elizabeth Warren’s emerging campaign is a radical proposal to break up the tech giants. She did a robust defence the other day of her proposal. we need to do more, and do it very soon. They [the tech giants] are destroying natural resources the way oil giants did before the government stepped in. However our political leaders, like most users, don’t understand. The natural resource they are destroying is the World Wide Web, an open, unowned resource that has fostered the innovative environment that gave birth to Google and Facebook. Google is acting as if it were the government, without any checks and balances, no oversight, no redress of grievances. They say they’re doing it for the good of the net, but we know they’re a huge corporation, and that’s not how it works. Facebook is sucking the life out of the web, along with Medium (where Warren published her manifesto!). Some simple rules, if followed, would restore balance to the web ecosystem. But there are no rules here, so they run wild, and take whatever isn’t nailed down. They’ve had a fantastic run, but it’s long past time for some rules, and consequences for not respecting that we all have ownership of the resource they are foreclosing on. Since the late 1950s, my native land’s grand strategy — initially for survival and later for prosperity — was to be welcoming to foreign multinational companies. For half a century, that strategy worked well. But now it’s become problematic. Why? Because some of the giant multinationals which have made Ireland their European bases have become toxic. Chief among these is Facebook, the leading data-vampire. Until the other day, we had our suspicions about the subservience of the Irish government to the wishes and requirements of the Zuckerberg empire. Now — thanks to two remarkable pieces of reporting — we have some evidence of the cosy relationship that developed between Facebook’s second-in-command, Sheryl Sandberg (the ‘Typhoid Mary’ of surveillance capitalism, as Shoshana Zuboff describes her) and the previous Irish Taoiseach (Prime Minister), Enda Kenny. “great relationship” with Enda Kenny, the Irish prime minister at the time, one of a number of people it describes as “friends of Facebook”. Ireland plays a key role in regulating technology companies in Europe because its data protection commissioner acts for all 28 member states. The memo has inflamed data protection advocates, who have long complained about the company’s “cosy” relationship with the Irish government. 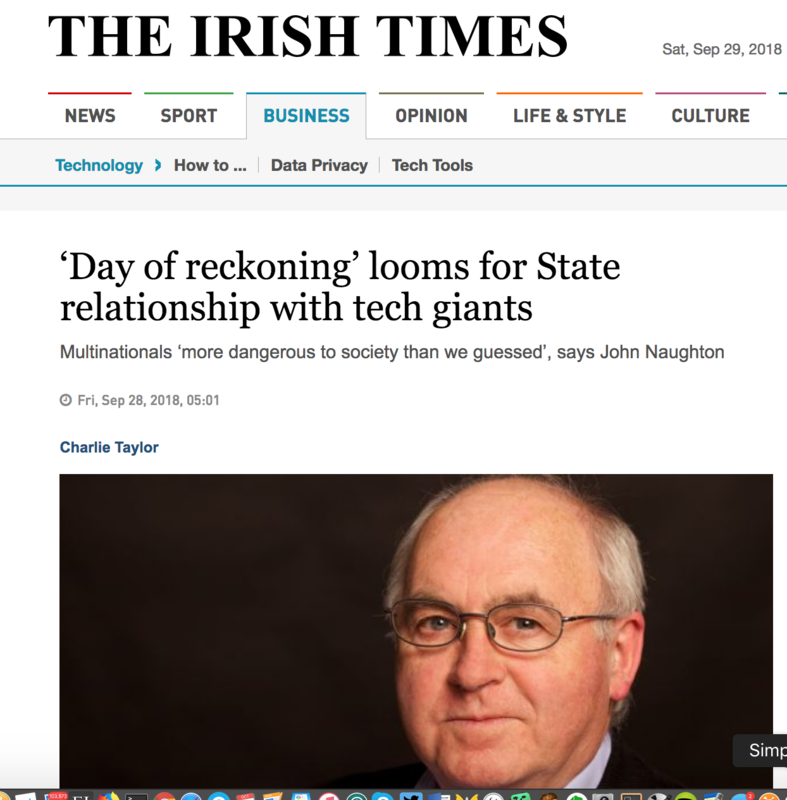 Kenny’s “appreciation” for Facebook’s decision to locate its headquarters in Dublin and points out that the new proposed data protection legislation was a “threat to jobs, innovation and economic growth in Europe”. It then goes on to say that Ireland is poised to take on the presidency of the EU and therefore has the “opportunity to influence the European Data Directive decisions”. It makes the extraordinary claim that Kenny offered to use the “significant influence” of the EU presidency as a means of influencing other EU member states “even though technically Ireland is supposed to remain neutral in this role”. The second revelation comes from a terrific investigation by the Irish Independent newspaper. This tells how, two days after the meeting the Taoiseach in Davos (where else? ), Sandberg wrote to Kenny, warning him how changes to taxation or privacy laws might lead Facebook to consider ‘different options for future investment and growth in Europe’. Following the meeting in Davos, Facebook’s Senior Policy team, comprising 15 executives from Washington, California, Dublin, and across Europe, requested a personal meeting with the Taoiseach in Government Buildings, Dublin on February 6 2014. Kenny did not meet the delegation but instead sent his special adviser, Paul O’Brien, the Secretary General to the Government, Martin Fraser, and two of the Taoiseach’s experienced assistant secretaries with responsibility for international economic matters, Lorcan Fullam and John Callinan. But then Kenny was given the treatment that generally suborns impressionable technically-illiterate politicians: an invitation to Facebook’s headquarters in Menlo Park, California, in June 2014, where he was granted a 43-minute audience with Sandberg. According to the Independent report, the mogul and her awestruck visitor discussed the need for one tax regulator in the EU, and also the issue of who would replace Billy Hawkes as the Irish Data Protection Commissioner (who was due to retire on August 31 that year). And a follow-up letter to the Taoiseach in June 2014 specifically mentions Billy Hawkes and the need for his replacement to be “a strong candidate”. 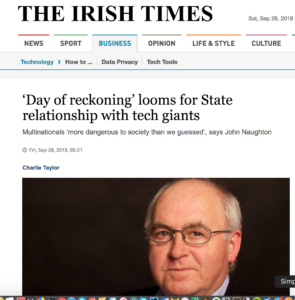 “While Mr Hawkes’s independence and integrity are undisputed”, says the Independent — with an attentive eye to legal niceties — “there is no doubt that Facebook would have been relieved in 2013, when Mr Hawkes refused to investigate claims that Facebook Ireland had transferred data to the States for examination by the NSA”. Background: Hawkes had refused the investigation on the legal grounds that Facebook was entitled to send data from the EU to the US under EU Commission Safe Harbour provisions. Interestingly, though, when Sandberg was being granted personal access to the Taoiseach, a judicial review of Hawkes’s decision had been initiated in the Irish High Court. And of course, in the end, the European Court ruled that the ‘Safe Harbour’ agreement was invalid. Referring to the tricky challenge (for Facebook) of European Data Protection Regulation, you and your staff internalised our concerns and were able to present them in a reasonable way, which has had a positive impact. …We hope we can rely on you for your continued leadership on this regulation since we still have more work to do here. And, on tax reform, I was pleased to hear that you are so involved in the OECD working group process on tax reform. Emphasis added. Pass the sickbag, Alice. the longing for a time when American politics was ruled by men of “high character” and a sense of “public duty,” the very antithesis of the present partisan era’s coarseness. What goes unstated, however, is the subtext of that yearning. All the florid remembrances are packed with fondness for a bygone institution known as the Establishment, hardened in the cold of New England boarding schools, acculturated by the late-night rituals of Skull and Bones, sent off to the world with a sense of noblesse oblige. For more than a century, this Establishment resided at the top of the American caste system. Now it is gone, and apparently people wish it weren’t. Actually, there is. For all its faults — and it was often horribly bigoted, in some places segregationist and almost always exclusionary — at its best, the old WASP aristocracy did have a sense of modesty, humility and public-spiritedness that seems largely absent in today’s elite. Many of Bush’s greatest moments — his handling of the fall of communism, his decision not to occupy Iraq after the first Gulf War, his acceptance of tax increases to close the deficit — were marked by restraint, an ability to do the right thing despite enormous pressure to pander to public opinion. But, and here is the problem, it is likely these virtues flowed from the nature of that old elite. The aristocracy was secure in its power and position, so it could afford to think about the country’s fate in broad terms, looking out for the longer term, rising above self-interest — because its own interest was assured. It also knew that its position was somewhat accidental and arbitrary, so its members adhered to certain codes of conduct — modesty, restraint, chivalry, social responsibility. Lots of problems with all of this, but an obvious one is that it’d be hard to describe the Kennedys as WASPS — not to mention the Roosevelts and the Vanderbilts (of Dutch origin), or the Rockefellers (who hail from stout German stock). And if we’re counting Germans, then surely the Trumps qualify? So the term WASP — White Anglo-Saxon Protestants — as “a social group of wealthy and well-connected white Americans, of Protestant and predominantly British ancestry, who trace their ancestry to the American colonial period” is probably more useful as a polemical term of abuse rather than as a precise description of a caste.